The name is Sleuth-ER, Martin Sleuth-ER, and while he hopes this finds you well, in good spirit and having a good day, he is writing to you to deliver to you a dire message of considerable importance. 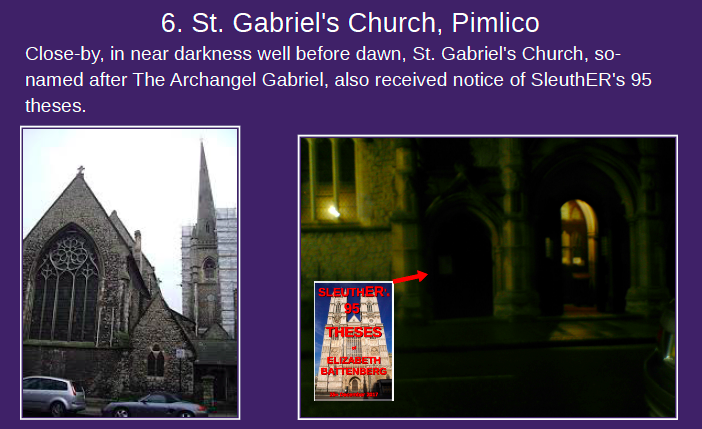 If you do not soon help Christ, in His Second Coming, to expose the fake stone, as used at the fake queen’s fraudulent Coronation ceremony, and as now deceitfully residing in Edinburgh Castle: then The Wrath of God will soon come down on not just you; but your abominable graven-image filled Abbey; your deluded Church of England; and your beloved fake queen Elizabeth. Likewise, the rest of her fake family and fake cronies will be similarly doomed. The reason for this is clear, and is this. 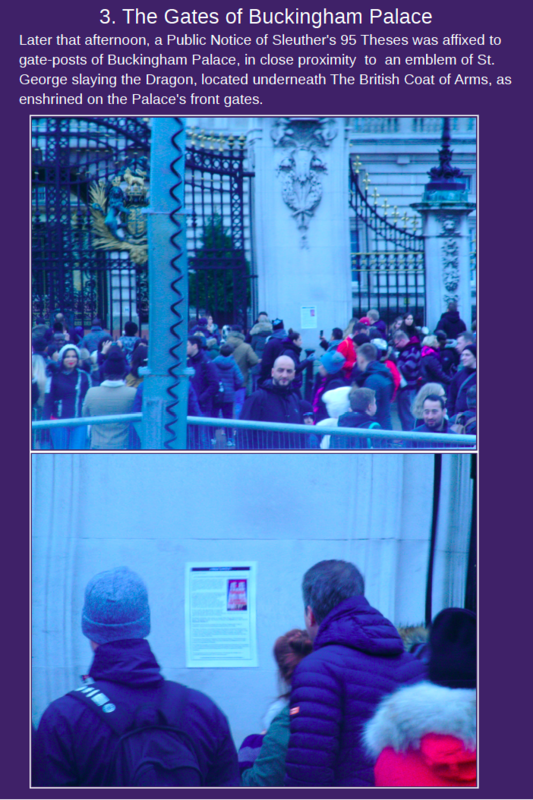 Shamefully no-one, has been, or is holding Elizabeth to account, for all her Unlawful actions over her sixty-four and a half years of absolute treasonous, fraudulent misrule. 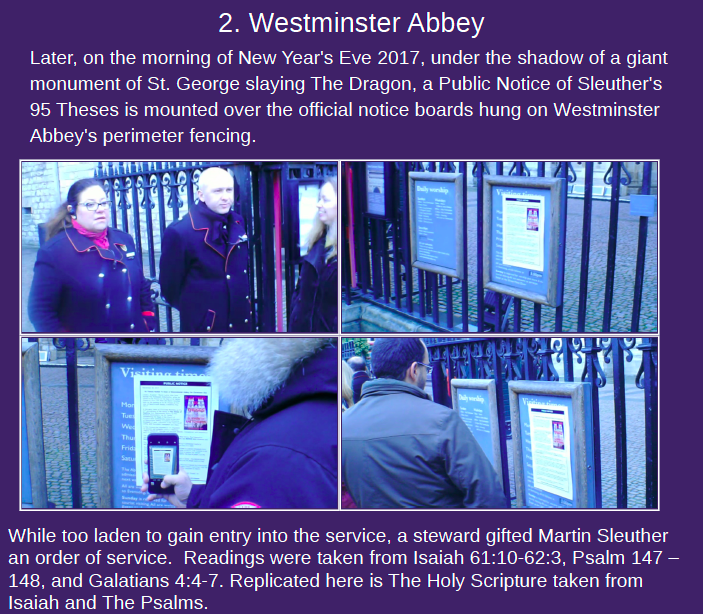 Sleuther’s 95 Theses was recently delivered twice to The Abbey’s front perimeter gates, once at 4am on Christmas Day, and then again on New Year’s Eve, by way of a Public Notice. 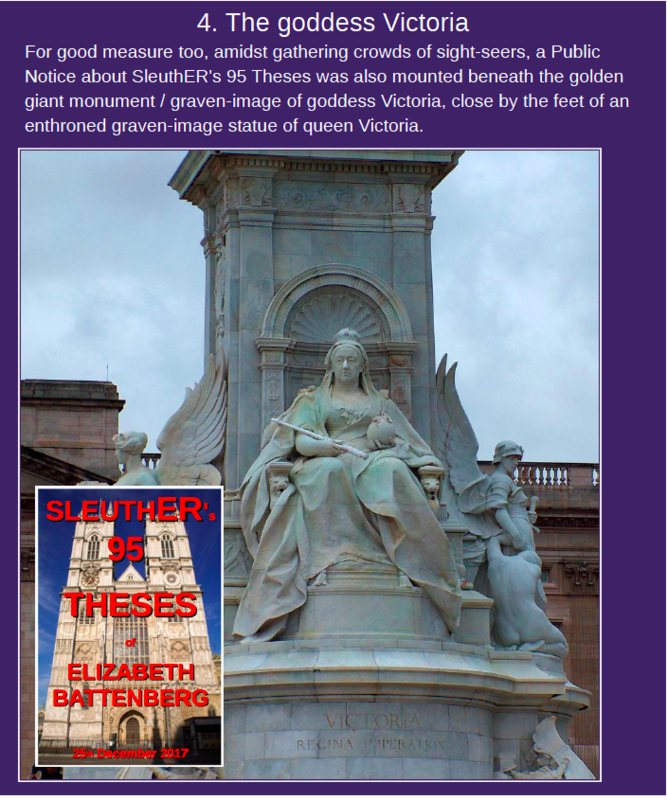 It offers utterly compelling evidence of Elizabeth’s treasonous misrule. Ever since Elizabeth’s fraudulent coronation, all past and present post-holders for the positions of The Archbishop of Canterbury; The Dean of Westminster; and The Moderator of The General Assembly of The Church of Scotland; have abjectly failed in their duties to God, and the British people, in this vitally important context, i.e. to maintain the Laws of God. Thus they have shown utter contempt for the Laws of God, not least because all have countenanced the perpetuation of a wicked deception about Jacob’s Pillar, The Coronation Stone/The Throne and The Real Truth about The Throne. In order for you to fully appreciate the magnitude of this message, you will need to read and digest five associated messages, as listed below. Your attention is also drawn to The Hall of Shame below. 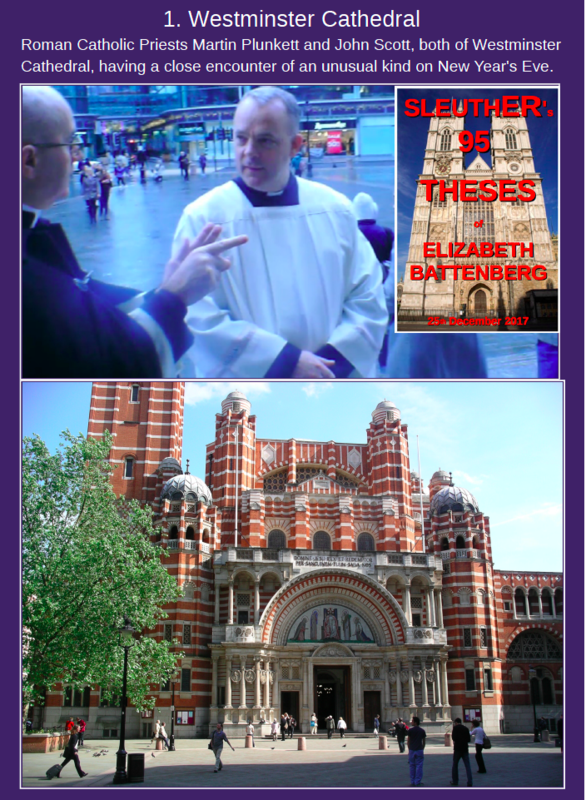 Finally, I would urge you to study Christ’s Seven Requirements for The Churches in Westminster, and do what you can to help Him, before it’s too late for you all. 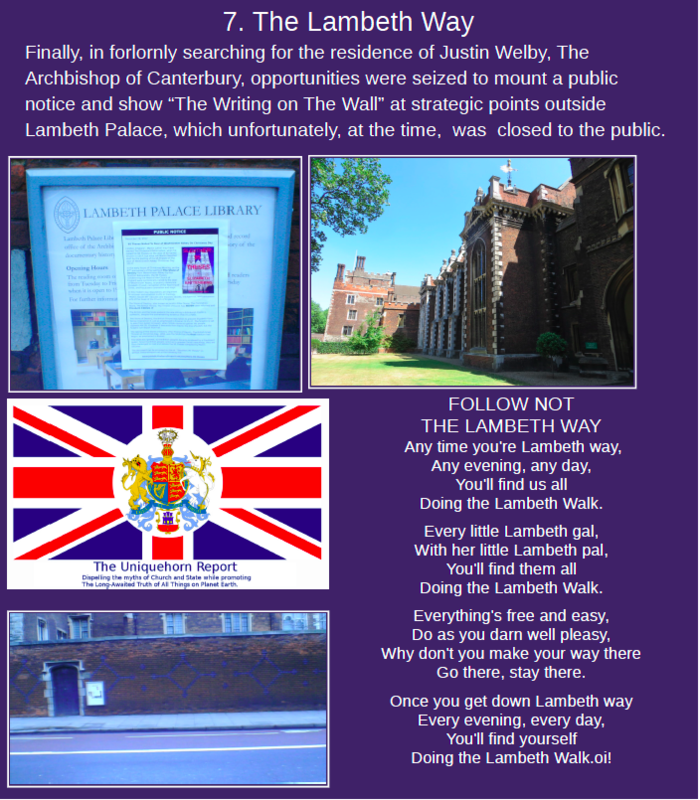 I write to you in your capacity of having a welcoming ministry in your Roman Catholic Cathedral in the City of Westminster, and because of our brief and somewhat unusual close encounter on New Year’s Eve, outside the doors of your cathedral, when you took possession of a Public Notice about Sleuther’s 95 Theses. 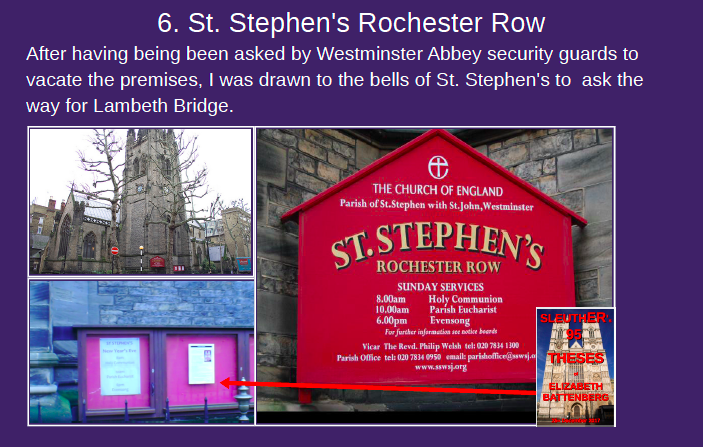 By way of a follow up to that important encounter, it is now time for me to bring to your attention seven requirements of the churches within the City of Westminster, as endorsed by The Lord, Christ in His Second Coming. You will find these seven requirements attached alongside this letter. You may also find both Christ’s letter and my correspondence to you publicised in full on the JAHTALK website. Just in case you are wondering why you, of all people, are receiving such a letter as this, perhaps it stems from your first name Martin, together with your surname with its Irish/Catholic connection, but in fairness far more importantly than that, it’s a CALL from OUR FATHER, for you to take some significant action in the building of GOD’s Kingdom. Serving in your capacity as a Roman Catholic Priest in Westminster, please, I beseech you, do what you can to share this personal, and open letter addressed to you with Cardinal Vincent Nichols, who in turn must ensure the letter gets passed up to Pope Francis, and Arturo Marcelino Sosa Abascal, the current Superior General of the Society of Jesus. Furthermore, acting in a spirit of ecumenism, I would also encourage you to please share this letter, and discuss its implications with your Church of England colleagues down at The Abbey. Last but by no means least, hopefully as part of your calling to obey God and follow The Teachings of Christ, JAH, The Lord, Christ in His Second Coming would like to invite you personally to Ireland, to meet here with Him, so that the “Seven Requirements of The Churches of Westminster” can be discussed in more detail, and you can learn the TRUE Teaching of Christ from Christ Himself, instead of the satanic nonsense you’ve been taught in seminaries, in an amicable and constructive setting, both in relation to the City of Westminster, and to the role of The Roman Catholic Church, at an important phase during Christ’s Second Coming. Given your vocation, and with a name like yours, the likelihood of you being a distant relative of Oliver Plunkett, who was cannonized in 1975, is not lost on us. Do you know that Loughcrew, the place where the Irish canonized saint was born, just so happens to be the town of the burial place of The Old Testament Prophet Jeremiah? Since you were kind enough to momentarily engage with me on New Year’s Eve, I would be most grateful if you could acknowledge safe receipt of this email, and letter, and I very much hope you will get back to me with a positive reply about the offer to help you, and the people of Westminster, including those flocking to worship at your neo-Byzantine styled Roman Catholic Cathedral. P.S. If you are somewhat puzzled by the circulation list for this correspondence, please read beyond Christ’s Seven Requirements for The Churches of Westminster, and note carefully what other grounds were covered within the City of Westminster on New Year’s Day, both before, and after our close encounter of an unusual kind. Matthew Hancock MP, Secretary of State for Digital, Culture, Media and Sport. 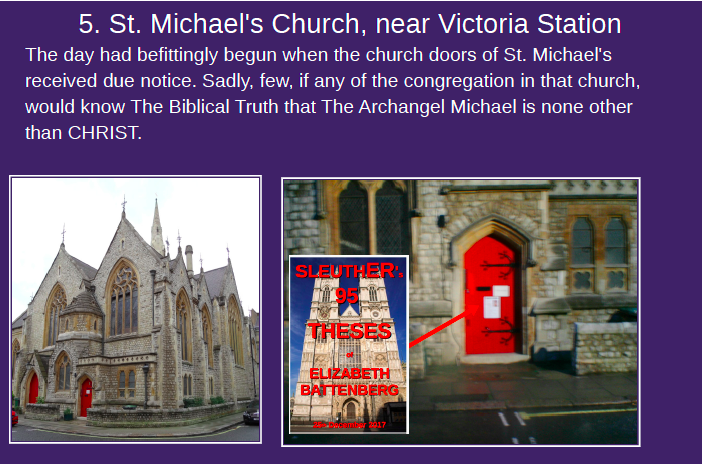 With immediate effect, collectively, the churches of Westminster must publicly call for ELIZABETH TO GO, and simultaneously demand that the rest of the corrupt and obscenely self-indulgent fake British Monarchy step aside in favour of Christ in His Second Coming. Failure to heed this imperative, will soon bring down The Wrath of God down upon not just on the city of Westminster, but also on the Anglican church and the church of Rome. 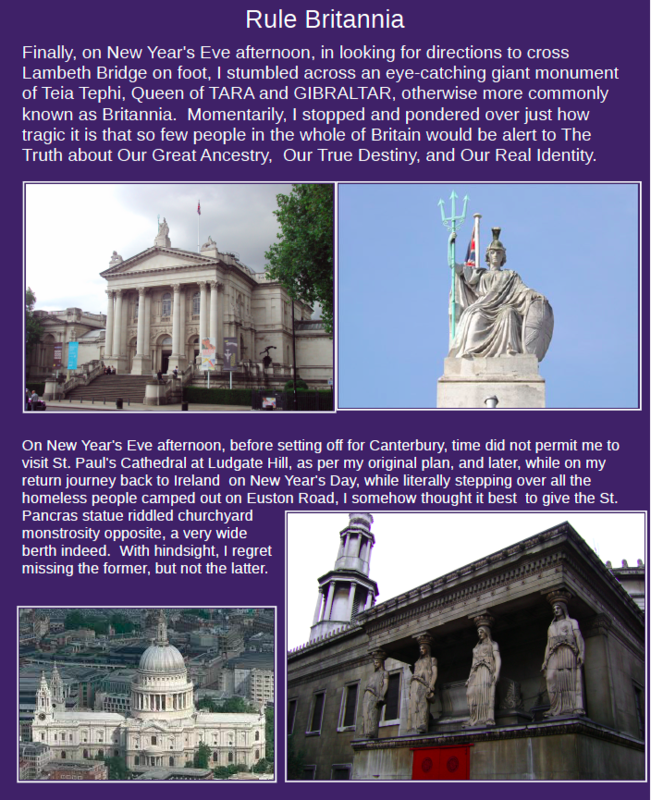 Collectively, the churches of Westminster must cease all the deceptions which merely serve to hide the true identity of the British people from the public at large. The churches of Westminster must publicly recognise that The British are The True Israelites, The People of The Covenant, and that the English people (Anglo-Saxons) descend from Jacob and Joseph / Ephraim and form an integral and pivotal part of the ten lost tribes of Israel. 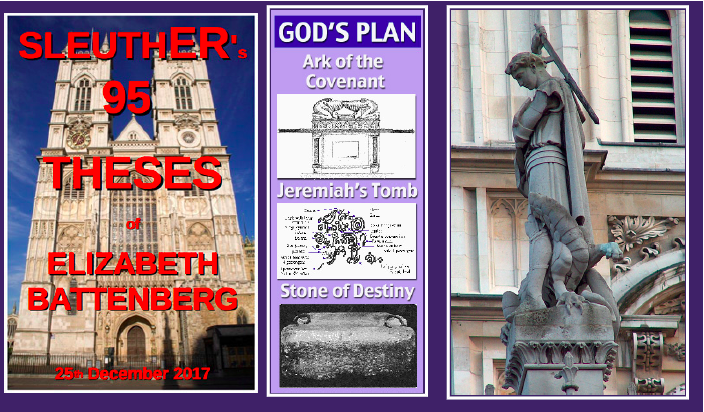 Collectively, prior to Elizabeth’s forthcoming abdication, as prophesied in Ezekiel 21:25-27, and others like Nostradamus and Columba, the churches of Westminster must impart an unequivocal message to The British People, that JAH, Christ, in His Second Coming, needs to be given His Rightful British Israelite Throne which was first claimed in Sheffield on 13th June 1988. Strictly adhering to the messages contained with The Way home or face The Fire, which is The White Stone of Revelation 2:17. 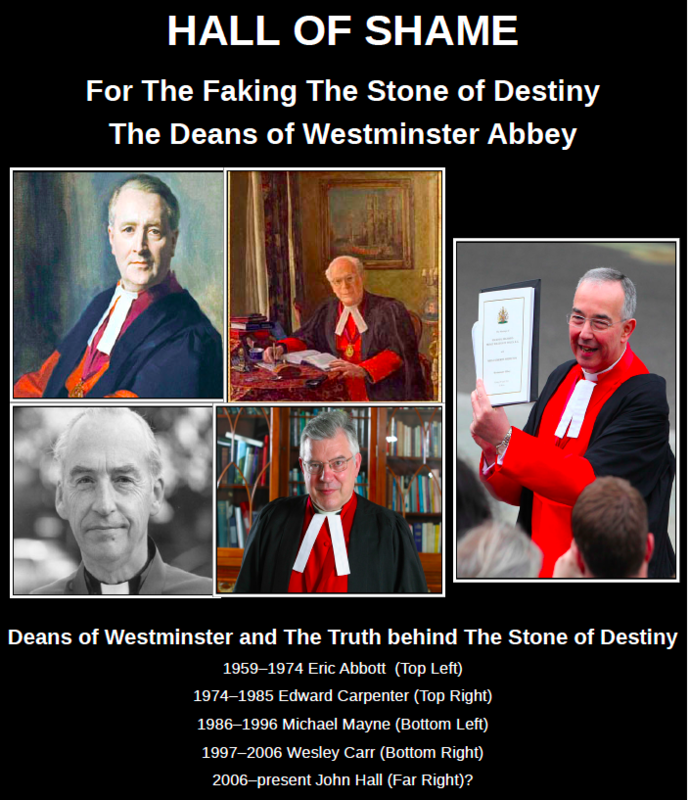 Collectively, the churches of Westminster must repent before CHRIST for all their erroneous ways in leading their flocks astray about GOD’S LAW, by falsely teaching, over the course of modern history, that it has been abolished. Instead of using churches for all your false teachings, dished up with an array of traditional hymns and rituals, many of which are blasphemous to GOD, all church buildings must be handed over to Christ and used instead as Community Centres, and for the community to learn THE SONG OF MOSES and THE SONG OF THE LAMB.